Wader Quest: Wader Quest the newsletter July issue out now. 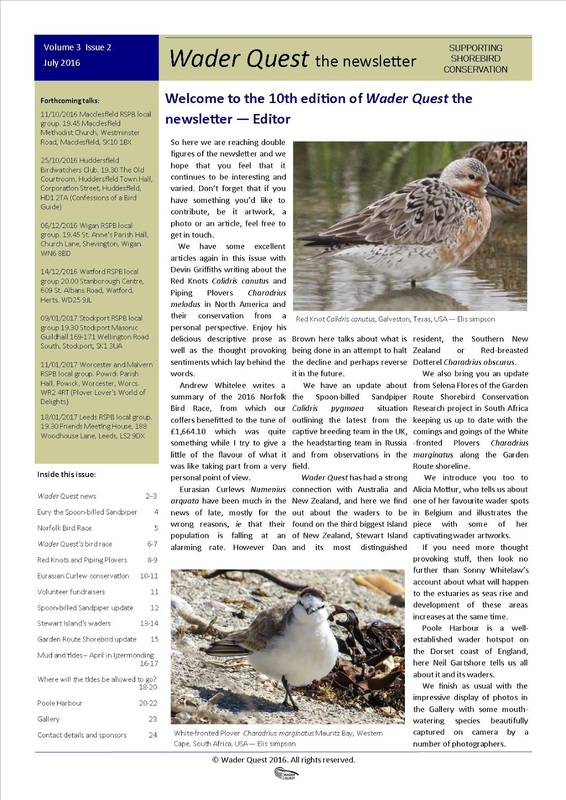 Wader Quest the newsletter July issue out now. Every three months Wader Quest issues an e-newsletter with up to date information on the comings and goings of the charity, what we are up to and what we are intending to be up to, in the coming months. In addition every issue has a number of articles written specifically for the newsletter by guest authors about a great variety of subjects related to waders from around the world. In this months issue (vol 3 issue 2), our tenth, for example there are articles about the Red Knots and Piping Plovers from the USA, Eurasian Curlew conservation efforts in the UK, updates on the Spoon-billed Sandpiper saga from Russia, the waders of Stewart Island from New Zealand, an update on White-fronted Plover research from South Africa, a wader hot spot in Belgium, a thought provoking article about the future of estuaries again from New Zealand and a piece on the waders in Poole harbour, also in the UK. If you would like to see these articles in full and receive the quarterly e-newsletter with information about waders from around the world, then simply sign-up as a Friend of Wader Quest for just £5.00 a year for an individual subscription and you will be sent the latest newsletter and three more during the next 12 month period. Furthermore, we are always looking for new writers to fill the pages each issue, so if you have an idea for an article, a photo you want to share or an artwork perhaps, then let us know. Note to potential contributors: the e-newsletters are issued in January, April, July and October around the middle of the month (aim; 15th). Copy for inclusion should reach us by the 1st of the month of issue.